Pakistan Foreign Minister Shah Mahmood Qureshi (left) Hurriyat Conference Chairman Mirwaiz Umar Farooq. 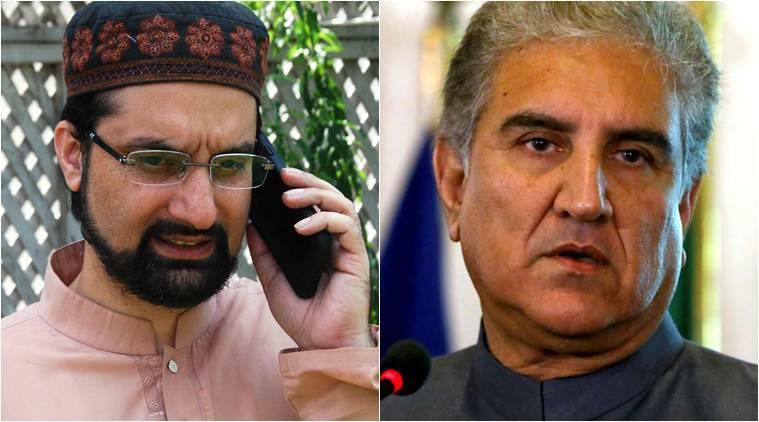 In an unusual move, Pakistan Foreign Minister Shah Mahmood Qureshi Tuesday dialled All Parties Hurriyat Conference chairman Mirwaiz Umar Farooq to brief him on “the efforts of the government of Pakistan to highlight the gross human rights violations” in Jammu and Kashmir. This is the first time that the new government in Pakistan, under Prime Minister Imran Khan, has reached out to the Hurriyat. Qureshi also informed the Hurriyat leader about events being organised in London, including at the House of Commons and an exhibition on February 4-5, where these issues will be highlighted. Official sources in Delhi told The Indian Express that it is “extremely unusual” for a top Pakistan government representative to call Hurriyat leaders directly, and said that they do not recall any such conversation in the last decade. Usually, they said, Pakistani representatives meet Hurriyat leaders while visiting India, and the Ministry of External Affairs is kept in the loop. The NDA government, however, has drawn a red line on meetings between visiting Pakistan representatives and Hurriyat leaders over the last four-and-half years, even leading to the cancellation of talks at the level of Foreign Secretary and Foreign Minister. According to Mirwaiz, Qureshi reiterated that “primarily, hum chahte hain ki baat-chit se hi saare masle hal ho (we want all issues to be resolved through dialogue), but there was no response from the government here”. Reacting to the 10-minute conversation, sources in Delhi said it reflects “the duplicity in the Pakistan leadership’s approach” while referring to Imran Khan’s call for dialogue. “Such an attempt by the Pakistan Foreign Minister is a regressive step and is contrary to the overall perception, which the Pakistan leadership is trying to create,” sources said. The Pakistan Foreign Minister also raised the June 2018 report issued by the Office of the High Commissioner for Human Rights and the APPKG report of the UK Parliament. India has rejected both these reports. “Pakistan has been and continues to foment cross-border terrorism in India. Its repeated attempts to incite disharmony and violence in India continue. The media antics of its leadership cannot divert attention from the fact that the Pakistan establishment’s hands are stained with the blood of innocent Indians, including in J&K and in territory under its illegal occupation,” sources in Delhi said. “Pakistan needs to focus on addressing the human rights situation within its own territory and promoting and protecting its own citizens, especially from the minority community. The persecution and discrimination of different ethnic populations, including Pashtuns, Baloch, Ahmediyas, Hindus and Sikhs in Pakistan, need to end,” sources said. “The people of India will defeat all nefarious designs aimed at creating disharmony and terrorist violence in India,” sources said. Mirwaiz, meanwhile, said that he would like to attend the events in London “to raise the issue of Kashmir” but does not have the documents needed to travel abroad. “My passport expired in 2012 after my visit to Geneva, and has since not been renewed except for this visit to Saudi Arabia (for the Umrah last year),” he said.